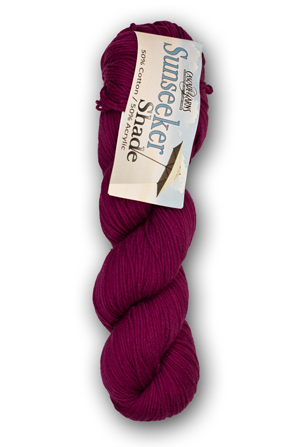 Sunseeker® Shade, the newest yarn in the Sunseeker® line, is Sunseeker® yarn without the sparkle. It is the perfect combination of acrylic and cotton in a DK weight giving it a lighter feel with durability and a great hand. Because of it's machine washable and dryable quality and with a wide range of color choices it is the perfect yarn for lightweight, summer items, baby garments, kids, and shawls.